Former Texas Tech head coach Tommy Tuberville may not be making any trips back to Lubbock any time soon. In a radio interview in Alabama, Tuberville reflected on his time as Auburn head coach and how he was essentially run out of town and forced to seek shelter in Lubbock. Lubbock has never been confused as much of a tourist city or one of the top destinations on anyone’s to-do list, but drawing a comparison to Iraq seems rather harsh. I have never been to Iraq or Lubbock, personally, but I feel confident in suggesting this may have been a slight exaggeration. Of course, Tuberville was saying this with a hint of sarcasm and humor to sit well with the Alabama-based radio show. It made for a good laugh with the audience, and odds are Tuberville wouldn’t have said the same exact thing had he been interviewed by a station or show in Lubbock. Of course, as it turns out, Tuberville may actually be speaking on his own experiences as he has been to Iraq to make the comparisons authentic. Tuberville’s foundation has worked to build homes in Iraq for wounded kids and he has even coached flag football with troops (against former Georgia and current Miami head coach Mark Richt).
.@TTuberville: Gonna write Tuesday piece on @AUUndercover Have Tommy Tuberville Foundation build homes for wounded kids in Iraq. @MarkPacker can't call in, but best event was a flag football game in the middle of Iraq coached by Tommy Tuberville and Mark Richt. Tuberville is currently residing in Auburn after losing his job at Cincinnati. The former coach has not ruled out the possibility of coaching again someday, and he flirted with the idea of running for governor of the state of Alabama before deciding against it. If coaching is not in the fold in the next coaching carousel, perhaps Tuberville could be a good fit for an analyst role in a TV booth or studio. Just don’t expect him to look forward to taking any jobs covering Big 12 games, where the possibility of returning to Lubbock remains on the table. Texas Tech seems to have a track record developing former coaches not exactly leaving on the most pleasant of terms in Lubbock. Tuberville clearly is not ashamed of taking cracks at Lubbock years after leaving the program at Texas Tech. 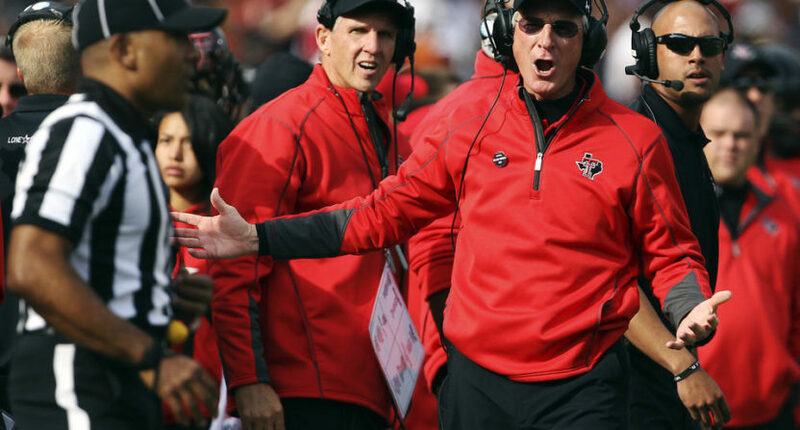 The man Tuberville replaced, Mike Leach, famously left on unpleasant terms as well after being suspected of mistreating the son of former ESPN college football analyst Craig James. Texas Tech hit a stride under Leach, so the bar was set pretty high for Tuberville coming in amid the controversy with the program. Tuberville only managed to go 8-5 at his best in three seasons on the job, with one bowl trip and victory to show for his efforts in Lubbock. He was out after a 7-5 season in 2012 and on his way to Cincinnati. The good news for Texas Tech now is they have a coach in Kliff Kingsbury who is all about Texas Tech. Kingsbury played quarterback at Texas Tech and seems to be as perfect a mix for the school as any. Tuberville was just an outsider who could never quite fit in.